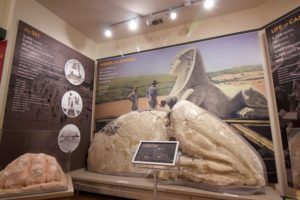 Guadalupe-Nipomo Dunes Center – The Guadalupe Nipomo Dunes Center is a tiny natural history museum with BIG plans! The Guadalupe Nipomo Dunes Center is a tiny natural history museum with BIG plans! Doug Jenzen, the Executive Director of the Guadalupe-Nipomo Dunes Center, received a call from community leader Susan Righetti, to share her plan to donate the Historic Far Western Tavern building. The building will become the home of the new Dunes Center. This call was the catalyst to rolling out the plans for a flagship museum to be built in the city of Guadalupe. Righetti and her family decided that this historical building would be of much greater value if it were put in the hands of the community that surrounds it. The Far Western building, at 899 Guadalupe Street, will undergo retrofit and renovation. It will become the new and improved Dunes Center natural history museum. It is five times bigger than the current Dunes Center Museum that is just up the street.